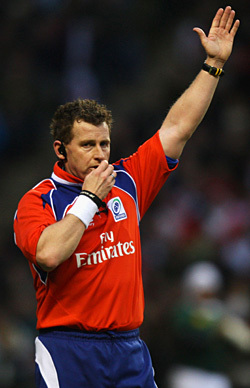 WorldRugby have announced their 2015-2016 HSBC Sevens World Series Match Official Panels, and there is a surprise inclusion to the list. 2011 Rugby World Cup Final Referee Craig Joubert has joined the team in a bid to be included in the Match Officials Panel to attend the Olympic Games in Rio de Janeiro in 2016. Jérôme Garcès was born in Pau on 24 October 1973, he is five foot eleven inches and twelve stone eight pounds weight. The 41 year old is married with two children. In Jérôme's spare time he likes nothing better than watching his young boys playing rugby at Laruns.